As you know, we recently had a sit down with our old friend Traveler and explained to her that the time had come for her to start contributing her fair share to the household economy. 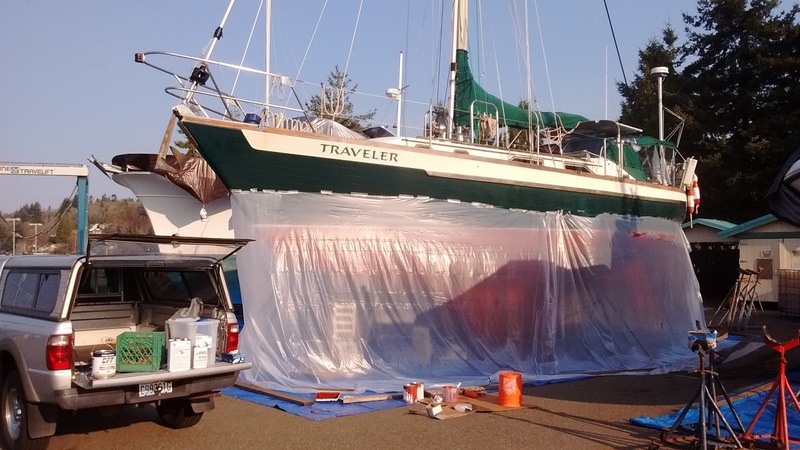 Living on a fixed income amid rising prices, escalating housing costs, out of control health insurance, and soaring varnishing expenditures, we were forced to sell dear Traveler into service. Yes, she's going to work. This winter we brushed up her bottom, greened up her top sides, and painstakingly restored her teak and holly floorboards. We've stocked up on PFDs, signed a bunch of forms, opened an LLC, and prepared for the summer onslaught of land lubbers tromping down the gangway to take pretty summer excursions on the "oh how the mighty have fallen" sailing vessel Traveler. Where once she was the sort that crossed oceans, she now shuttles land based creatures back and forth across the flat backwaters of the most southerly Salish Sea. 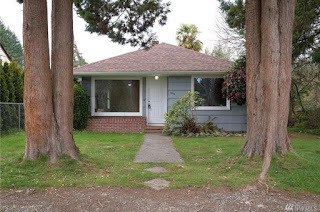 As a further insult, we've traded Connie's rental house in Tumwater for, as Zillow puts it, "A charming craftsman style home in the heart of West Olympia." We've truly swallowed the anchor. 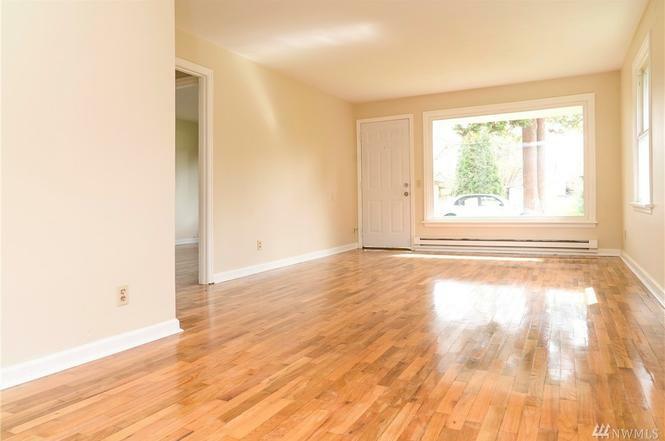 If our boat could read she'd cringe with jealousy at the words in the ad, "Refinished hardwood floors, warm colors add to the rustic character of this fine home." And she would say, "Why, that sounds like me! They've thrown me over for another... and an older woman at that!" To make up for this gut-wrenching blow, we've given Traveler lots of attention, sprucing her up quite nicely, a face-lift of sorts. Coming in the post are new glasses with little fishes and sailboats embossed on the sides. We've got new cups and plates with non-skid rubber bumpers to keep everything in place even in the fiercest of seas (like that's ever gonna happen in Budd Bay) and we're shopping for jewelry for Traveler in the form of a new silverware pattern with little anchors stamped on them. Giles has oak floors, Traveler has teak and holly. It's exciting buying a house, Connie and I together for the first time. We have lived in my house and we have lived in her house, but never in OUR house. This new house at 1910 Giles Ave NW is older than either of us. It's right in town, only ten minutes to the marina, and within walking distance to the CO-OP and all it's organic wonderfulness. And we've got lots of good friends who live nearby. Six coats of varnish on the floorboards. As you know, it's a crazy world in the real estate market here in the Pacific Northwest. We missed out on a couple of houses that we tried to buy but failed because our offer was not strong enough. 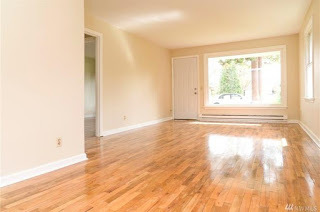 When we found this house we knew what we had to do... 1. put an offer in immediately and 2. use an escalation clause so our bid would top other offers. We waited the weekend to see the outcome. On Tuesday we saw we had captured first place, the multiple offers escalating 14k above asking price! Oh Traveler, you've got to really help us now. We spent a fortune on that other gal and now we've got to have a spectacularly profitable chartering summer. We are all doing our part for the family finances. Connie has a half dozen gigs coming up and I've got lots of old boating gear I'll be selling online. 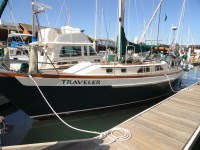 As the weather warms, the phone calls become more frequent and slowly we are accumulating reservations for charters. 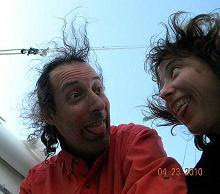 Three weeks from now we've got our first charter of the season when Connie and I will be happy as clams as we share some of the great times we've had sailing Traveler all those miles. We'll serve out the ice tea in those little glasses with the fish or sailboats embossed on the sides, pass around the CO-OP organic fresh fruit salad, and sing a song together as Traveler's shiny green hull slides through the waters and her white sails billow with promise.